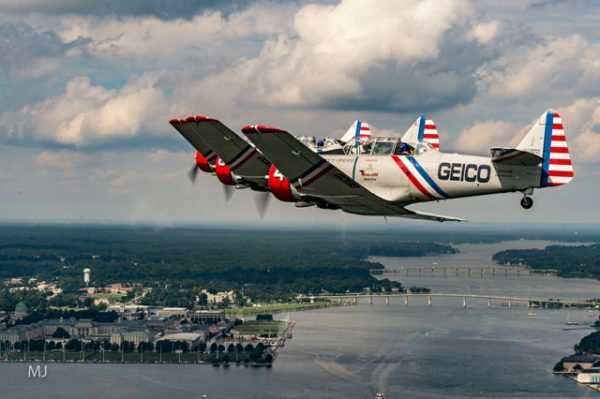 The world-famous GEICO Skytypers will perform during the 2017 Joint Base Andrews Air Show on September 16-17. 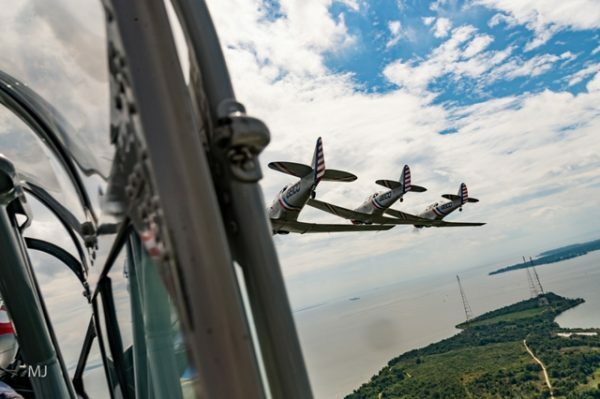 The team’s six vintage SNJ training aircraft will roar over air show crowds in a low-level, precision- formation flying demonstration honoring service members of the “Greatest Generation.” The air show routine includes more than 20 combat tactics and maneuvers that helped control the skies during World War II and the Korean Conflict. 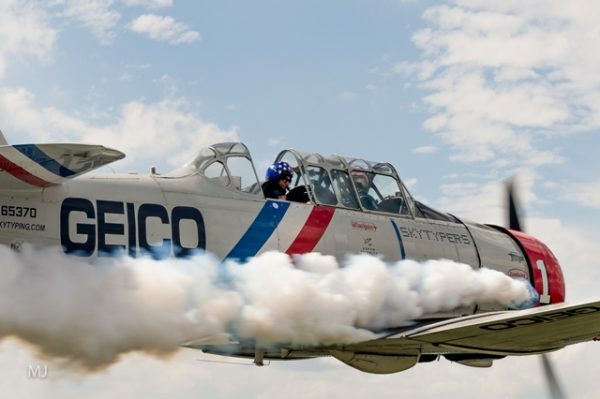 This year marks the first time the Skytypers have been to the Andrews Air Show since 2003. 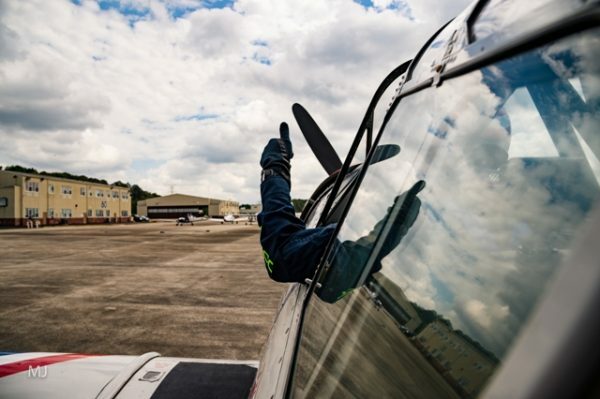 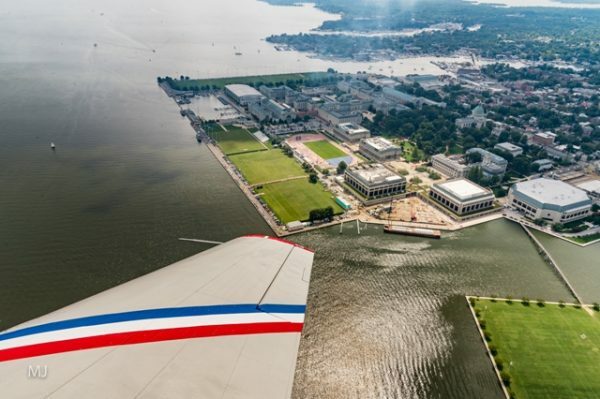 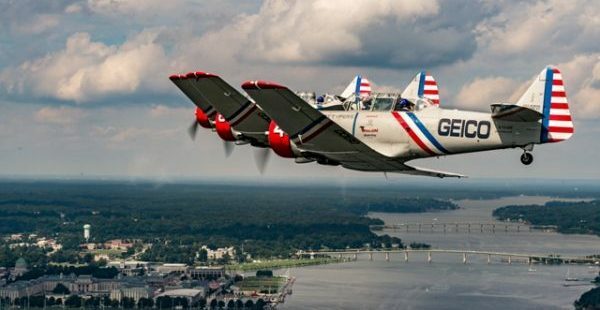 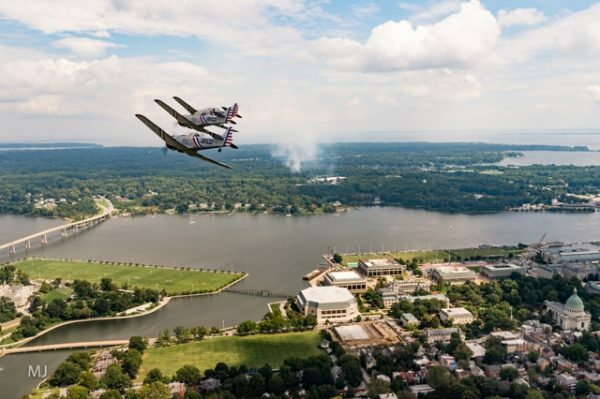 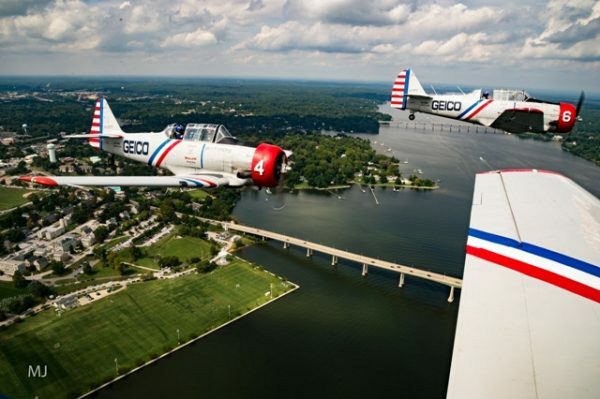 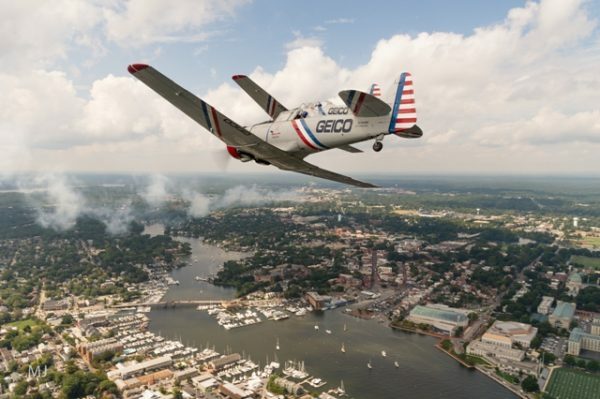 In preparation for the popular two-day event, the Skytypers took a select group of media representatives for a 30 minute demonstration flight over Annapolis, Maryland on Thursday morning. 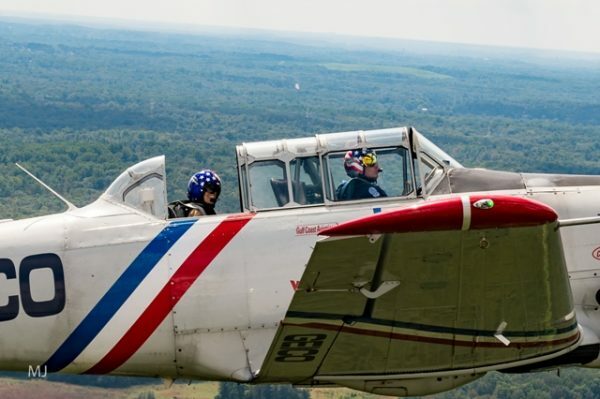 Baltimore Post-Examiner photographer Michael Jordan (just two days shy of his birthday) went along for the exhilarating ride. 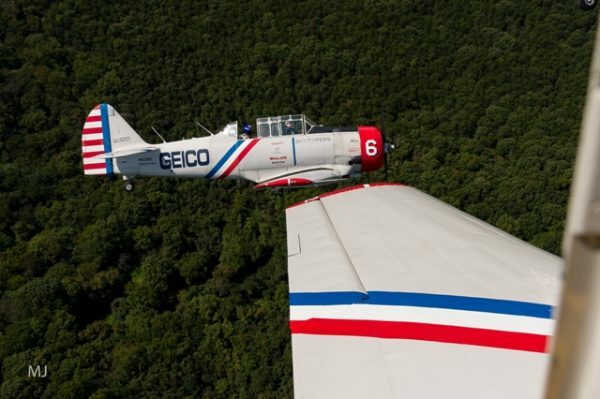 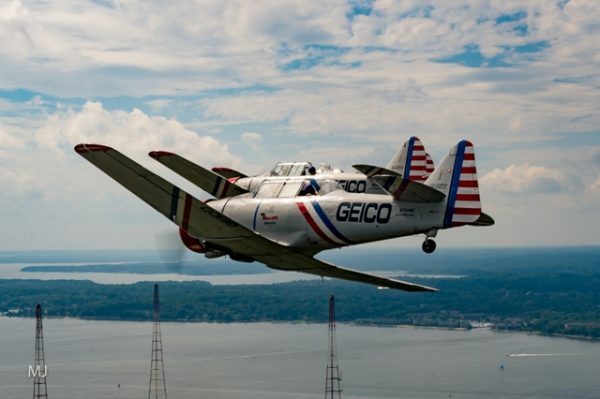 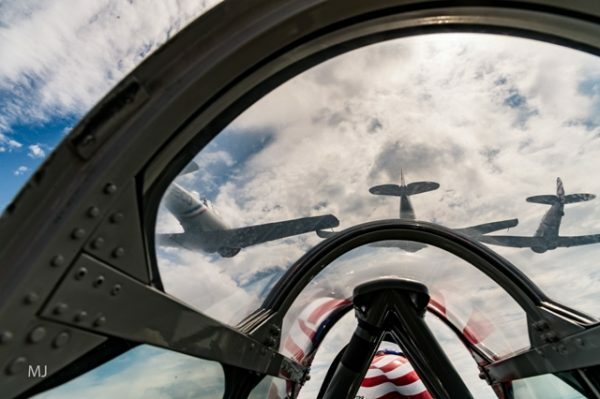 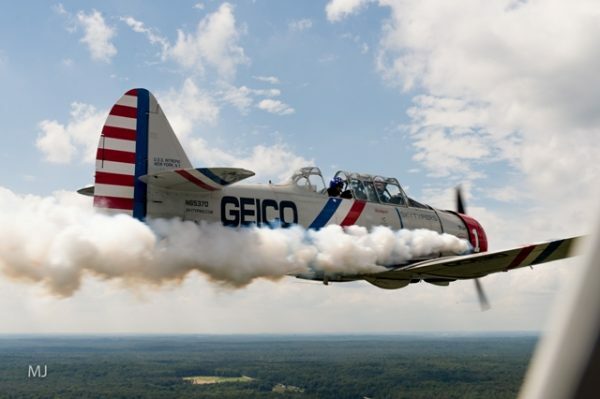 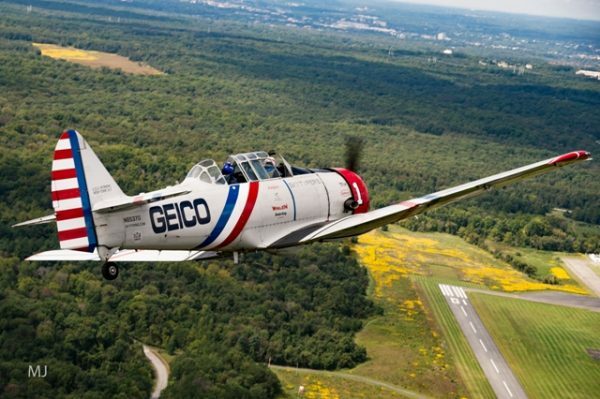 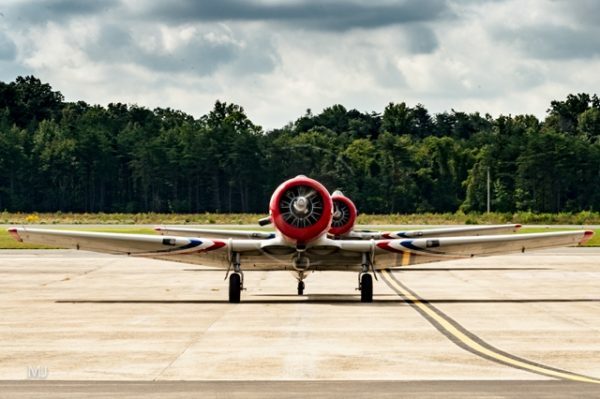 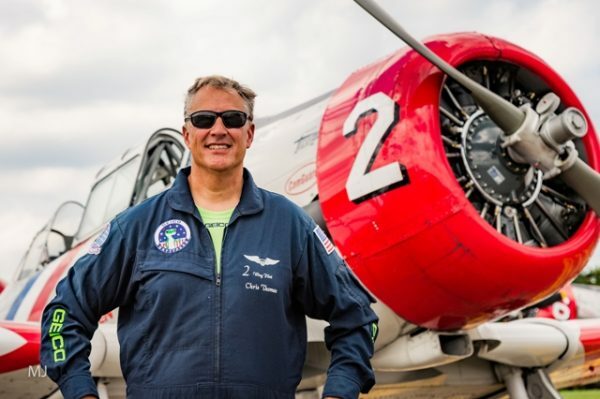 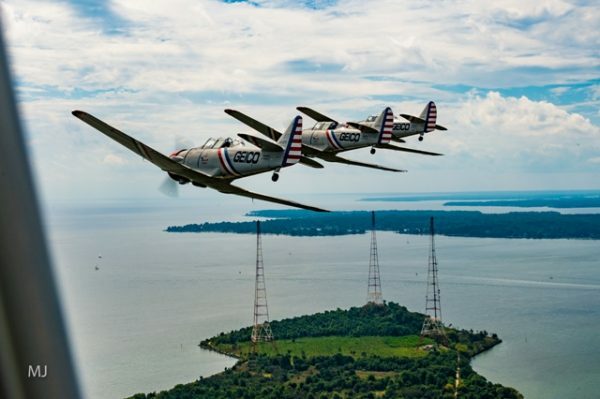 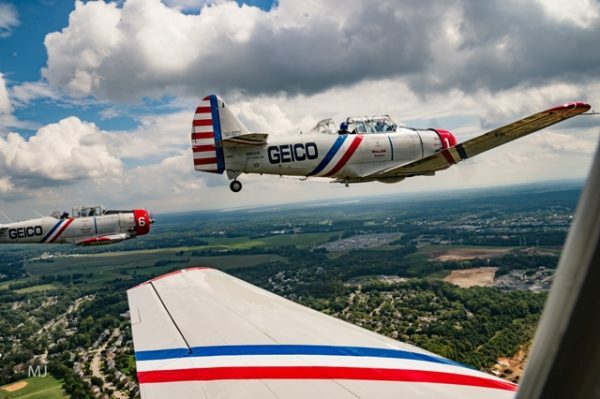 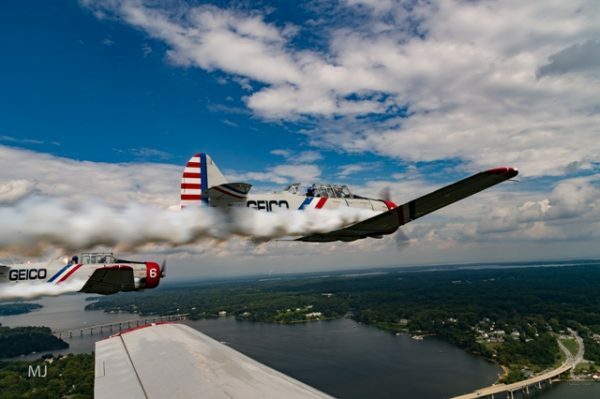 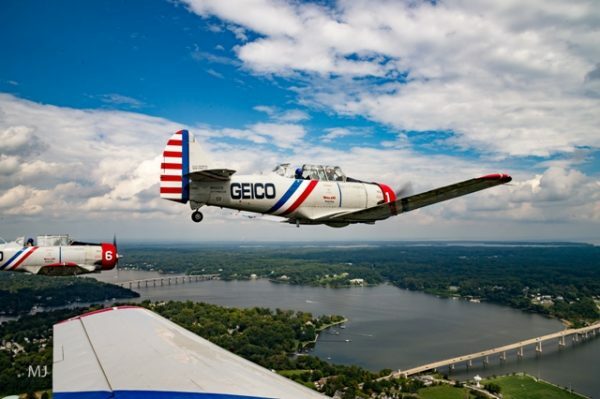 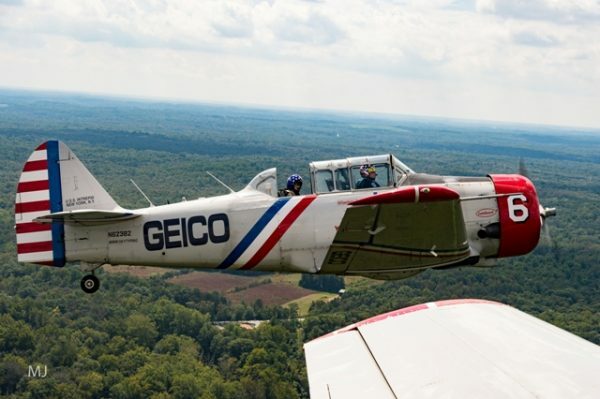 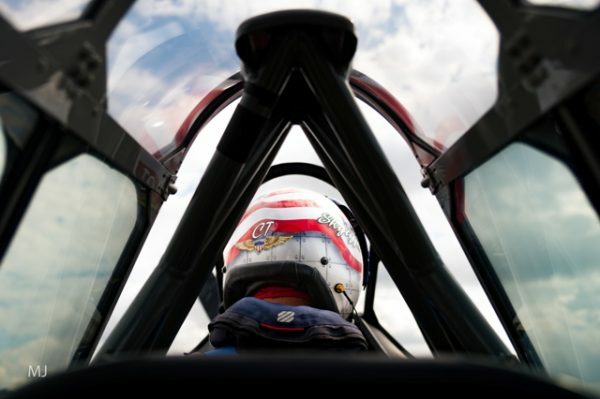 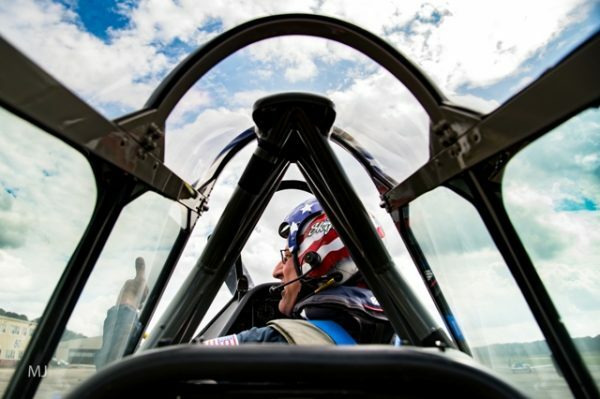 The GEICO Skytypers are based in Farmindale, NY, where the 75-year-old planes are maintained by a full-time staff of expert mechanics who travel with the pilots to every air show. 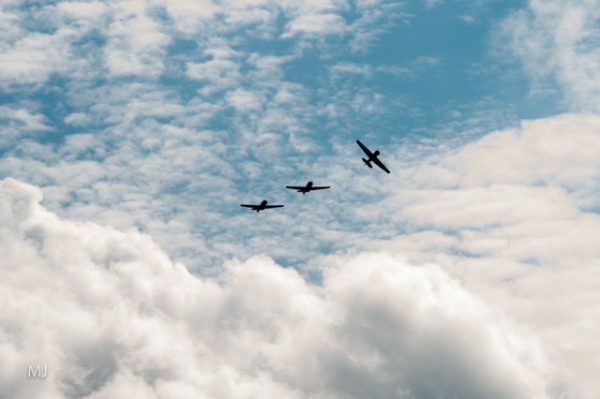 In addition to their air show performances, the SNJs are retrofitted to type giant messages in the sky. 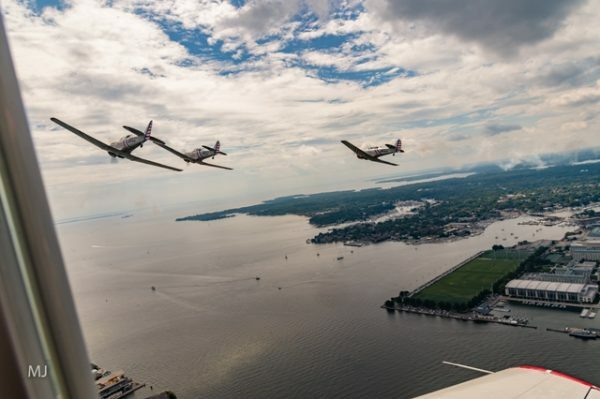 Flying wingtip-to-wingtip in a line-abreast formation, the lead plane sends computer signals to each of four other aircraft, synchronizing smoke releases to generate 1,000-foot-tall messages. 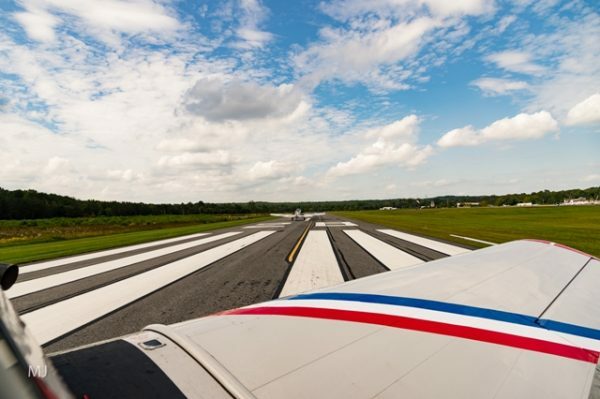 Each letter is higher than the Empire State Building and can be formed in three to four seconds. 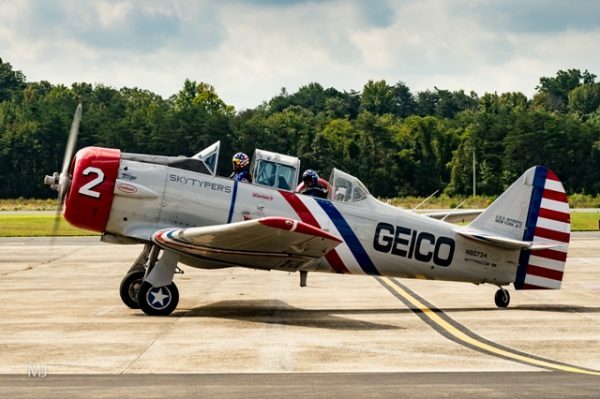 The gates will open at 9:00 a.m. on Saturday and Sunday with shuttle service from FedEx Field beginning at 8:00 a.m. 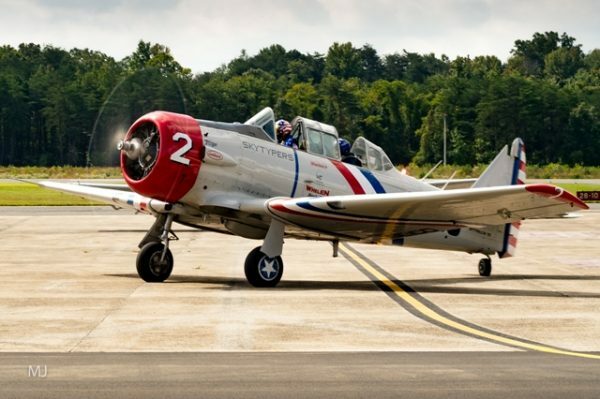 The event is free and open to the public on Saturday and Sunday. 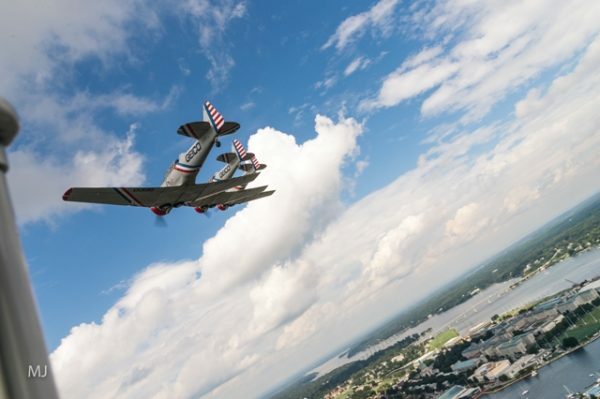 There is a rehearsal on Friday for DoD Cardholders only. 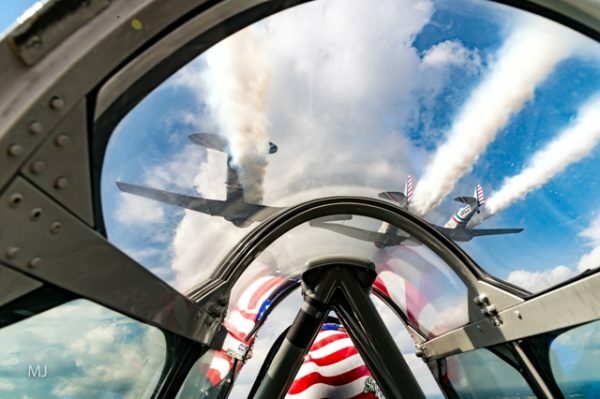 The USAF Thunderbirds will headline the weekend show that includes military and world-class civilian acts such as the USAF Air Combat Command F-22 Demonstration Team, US Army Golden Knights Parachute Team, Quicksilver P-51 Mustang, F-4U Corsair, Matt Chapman, B-25 Panchito, Shockwave Jet Truck, and many more. 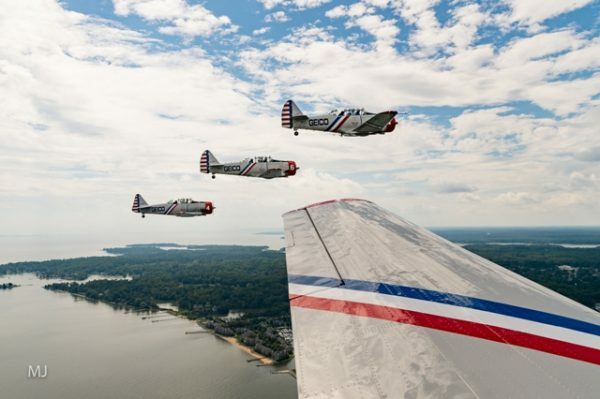 The Skytypers also are actively involved with children’s charities and youth organizations. 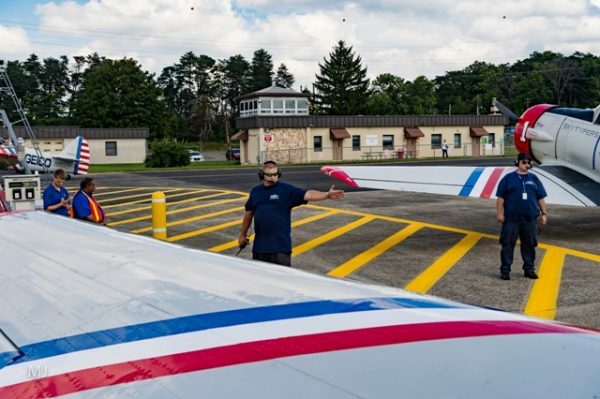 The team conducts presentations at youth centers, schools, hospitals, boys and girls clubs, community groups, ROTC programs, and veterans’ facilities. 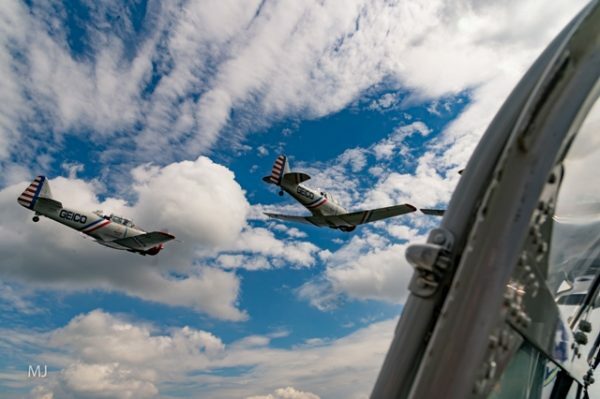 The team also hosts some of these events planeside. 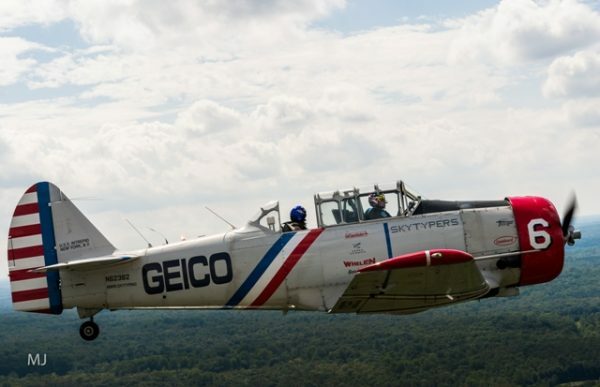 Organizations interested in partnering with the GEICO Skytypers can request an appearance by emailing the team’s public affairs contact at geicopao@skytyping.com. 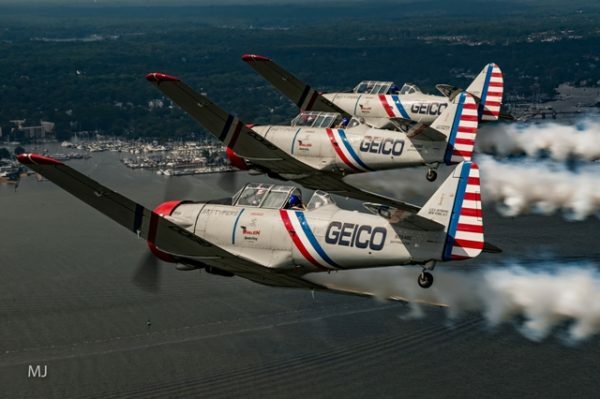 For more information on the GEICO Skytypers, visit http://www.geicoskytypers.com. 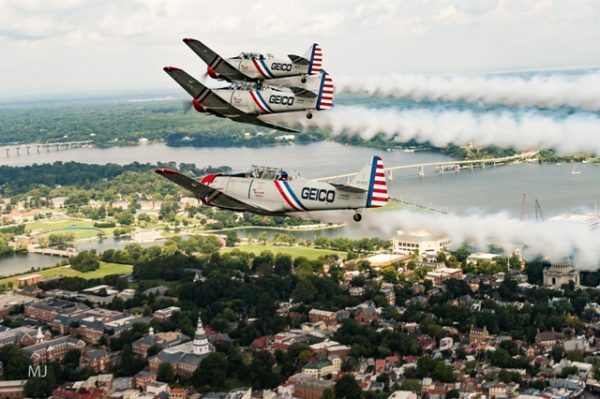 For parking, directions, and additional information for the Joint Base Andrews Air Show, visit http://andrewsairshow.org.